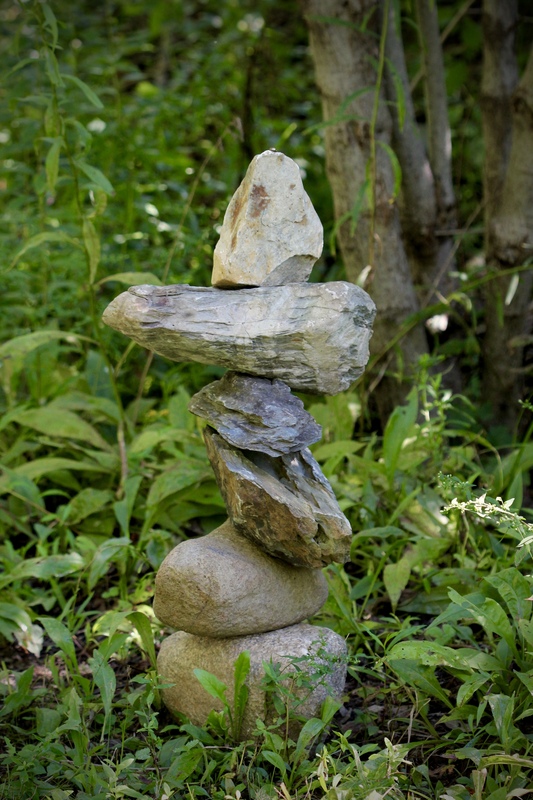 A little over two years ago, June 2015 to be precise, this blog featured Playing With Rocks ~ Lessons in Balance, Presence, and Coaching. 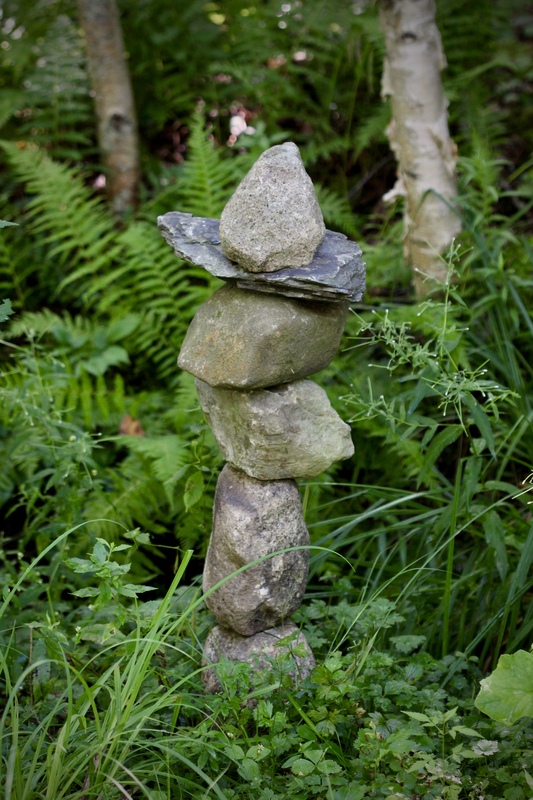 The written version was a paring down of a long rambling video I did of my stacked rock project along our woods trail. 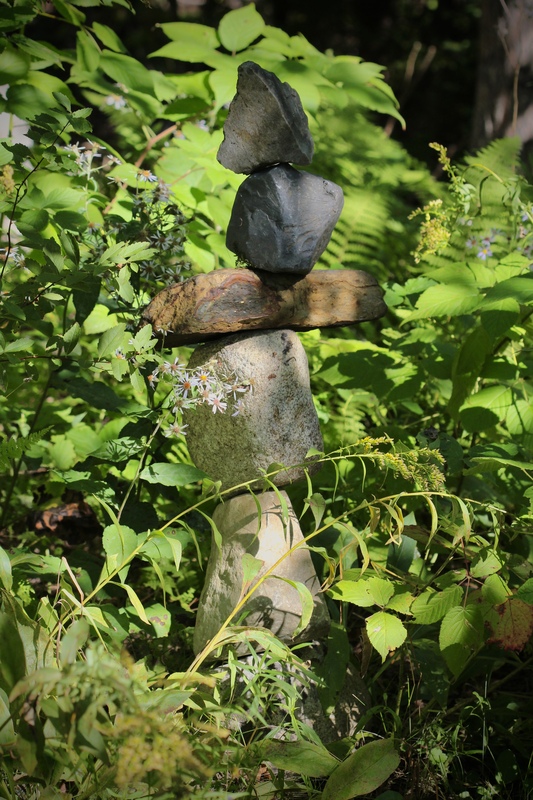 There was a long gap, about 10 months, before I blogged again, and did Rocks Revisited, where I again photographed my rock stacks that I had kept going (re-stacking as needed), and wrote some observations on the metaphors that struck me at the time. Well, more than two years since the first writing on this I still have about 16 or more rock stacks along the trail, and some recent photos are included here, and for some reason I feel compelled to write about them again in relation to where I find myself now. As before, they have tumbled and been re-piled, especially this year in the spring, it seemed the frost just kept heaving them out of the ground, toppling them over and over again until the earth finally relaxed. 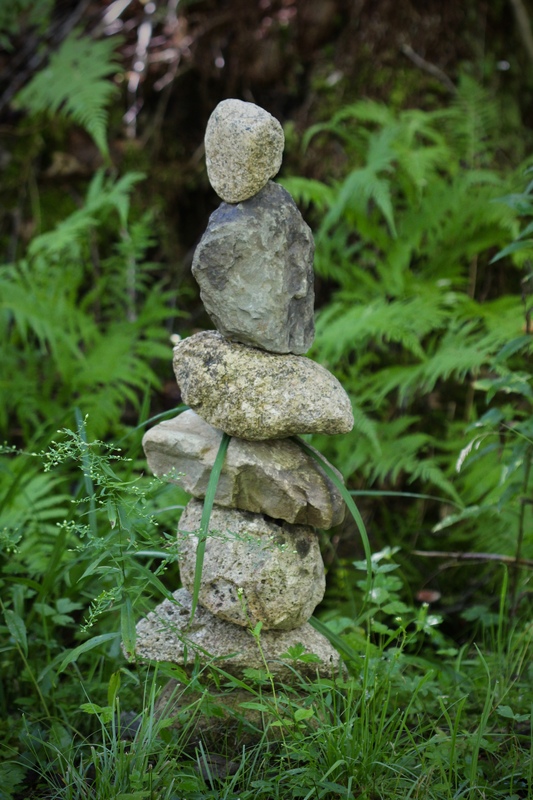 Some rocks have been taken to other piles, some omitted, a few new ones brought in, as they never seem to quite go back together the same way no matter how present and calm I think I am. I think about these rocks watching me as they are kind of like little people or sentinels lining the walk as far as Grandfather Hemlock. They feel like gatekeepers for the forest, somehow protective, standing guard. 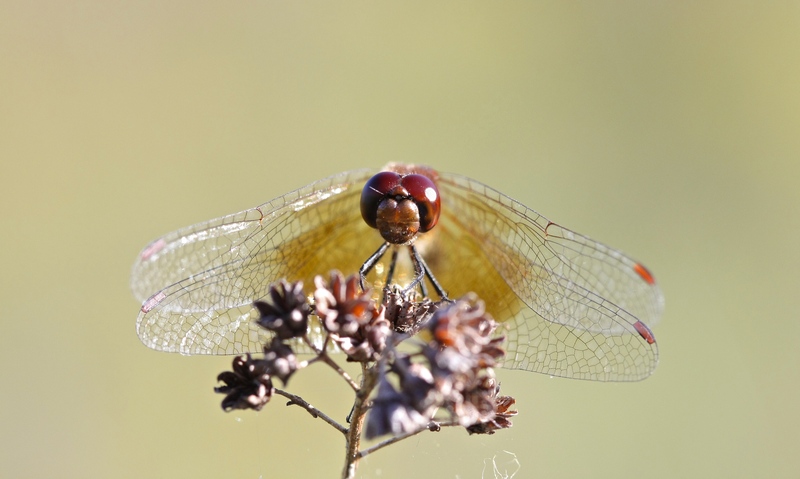 Their sense of stillness and solidity adds a kind of solemnity as sacred observers, bearing witness and holding the space for me to go through whatever I need to go through. The fact that they do occasionally topple over and need rebuilding reminds me that nothing is permanent, everything keeps changing, and I will always have to keep picking up some metaphorical rock or other and figure out how to re-build, scratching my knuckles and bruising my toes now and then. I have learned overall that that is a good thing. Maybe it’s a little message about resilience. If these rocks could talk they’d say they’d been watching me go through a lot of highs and lows and changes in the past two years. They’d say they have seen me cry, perhaps too often. There were the deep, painful sobs about my own feelings of inadequacy and shame and feelings of personal failure as I went through a period of what I think was a major depression. I had turned 55 and instead of “Freedom 55” I faced Fearful 55, fearful that I was never going to “make it”, having nowhere near accomplished the kind of things I thought I should have by then, especially financially, and facing fears about entering my “senior years” unprepared. They were also watching as I kept on walking that trail and asking for guidance until I found some signs from Spirit (in my interpretation at least) that helped me to navigate a way through and out of that inner hell. 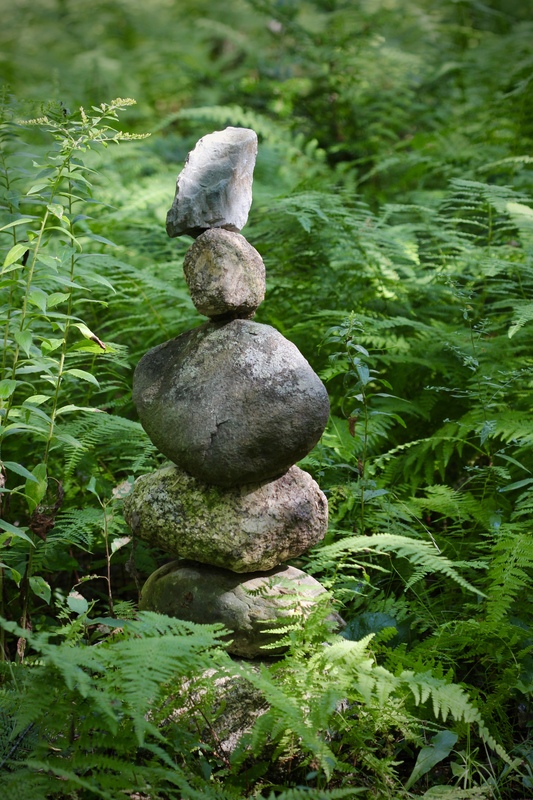 These rocks would also mention that they’d been privileged to witness some lovely beings join me in the woods at times for ceremony in a program I’d created to help them get in touch with their spirit and sense of the Divine in this sacred, natural space. I felt truly blessed to have this beautiful backdrop to our work together. 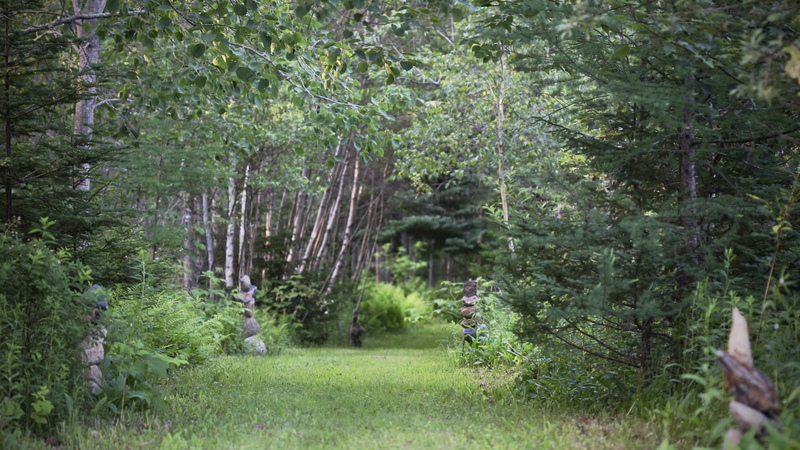 They might’ve wondered, however, how I could relate to these woods in such a way as to feel that divine connection and somehow still fail to see the divinity within myself. These rocks would mention that they’ll never forget the last half of 2016, when I spent as much time as possible on the trail with Angus Dog once his cancer had quickly recurred twice and we’d made the decision that there would be no further surgeries. I wanted to soak up every minute with my sweet buddy and let him run and chase squirrels and hares as long and as much as he was comfortable doing. His chases so frequently criss-crossed the area where the rocks are that it is likely he or the hares were to blame for at least some of them toppling. I made a video of walking in the woods with him last fall and put it on You Tube in case you are interested. My videos tend to be long, slow, rambles, so be prepared. And later these rocks would have witnessed my considerable tears again as I prepared to let him go and the grief afterwards, as well as my sadness at also having to put down two of our dearest elderly cats, Jack and Rosie, within the following three months. And in the past 6 months or so these rocks have witnessed my ups and downs as I come to terms with our putting this property up for sale and my grieving in advance as I intentionally disconnect (or have tried to) from this beautiful land we’ve been stewarding. But these rocks also get to see my almost daily delight and wonder as I make time to appreciate and document the natural beauty with my camera, getting down on my elbows for mushrooms and baby toads, or looking up into the leafy canopy, especially in autumn, or abstracting the rippling reflections in the pond and puddles, or trying to connect and converse with dragonflies and snakes. There is so much to appreciate in every walk. The colours keep morphing through the shiny matted browns of old leaves, rusty pine needles, and wet rocks in late spring, through the glowing chartreuse of new ferns unfurling, vibrant mosses cushioning boulders where squirrels leave a brown mess of spent pine cones, to the glowing canopy of fall reds and yellows like stained glass windows against a blue sky. 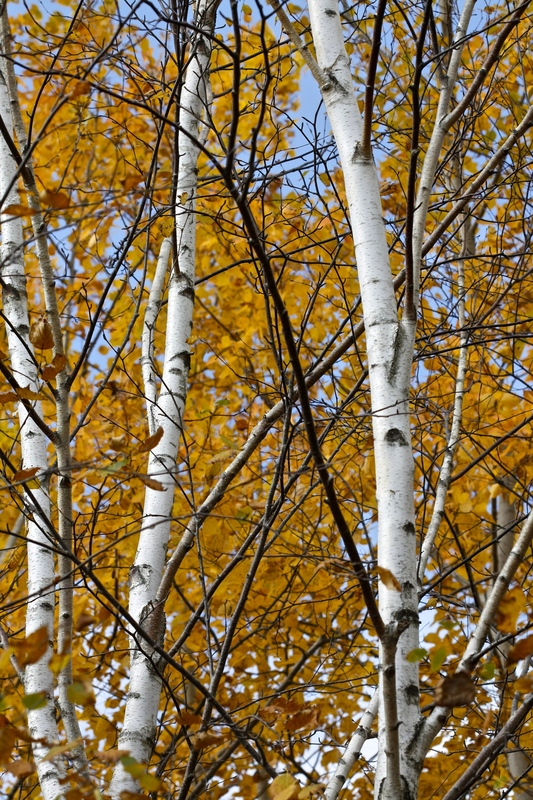 Leaves become mottled, ferns tanning like old leather until snow seals it all for months under a quiet, soft blanket. The sweet, earthy scents, the bird songs and squirrel chatter, the rustle of beech leaves that still dangle in winter, feed more senses. I notice the way the temperature abruptly changes in certain pockets along the path, and the way the sounds and mood can seem so different on rainy days compared to sunny ones. The cathedral of pines at the back is my temple and refuge as well as my inspiration. 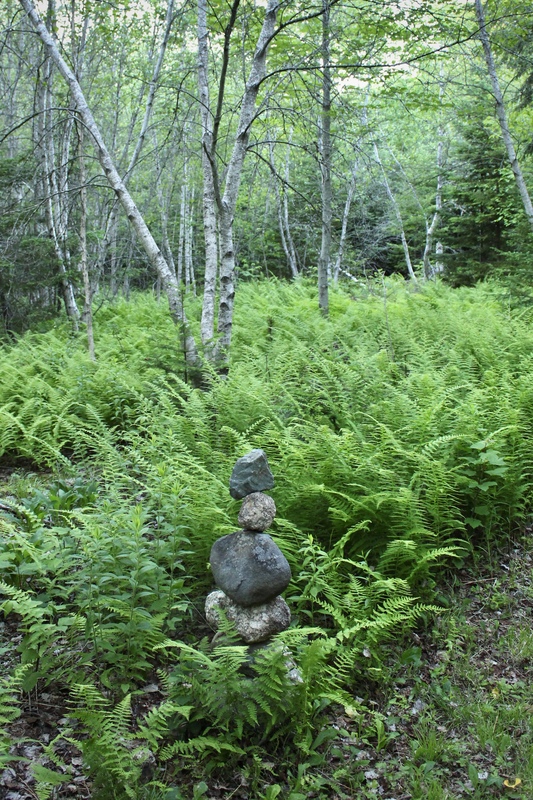 The rock piles are mostly at the beginning of the trail, but somehow signal that this walk is a special one and to pay attention. 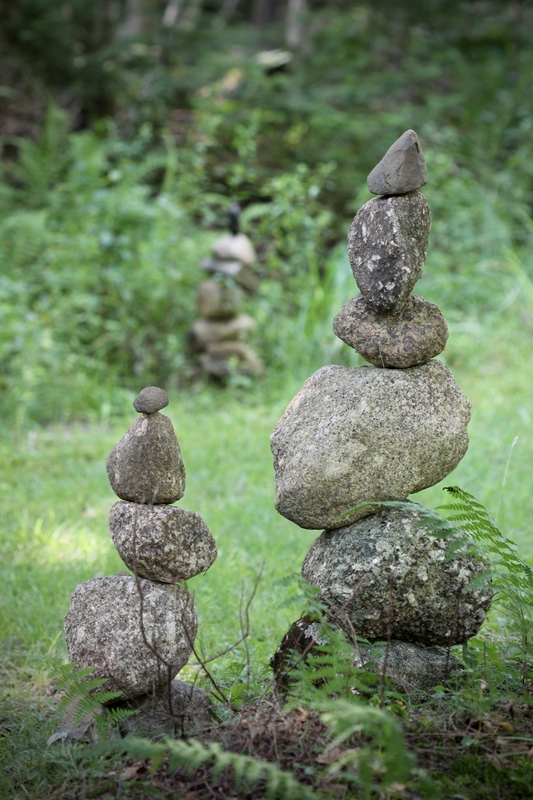 So, you might ask, since I am in the process of letting go of this place to sell, why do I keep re-stacking the rock piles? I have wondered myself if continuing to rebuild them is somehow keeping my energy attached to the land, and thereby repelling a sale. My intention is certainly not to do so. My intention is to keep the guardians present in a way that welcomes whomever is coming next. When someone walks that woodland trail to explore the property I want them to also feel that sense of wonder and delight that I do here. I know they will find their own way to experience that, and it does not at all need these impermanent statues to do it. 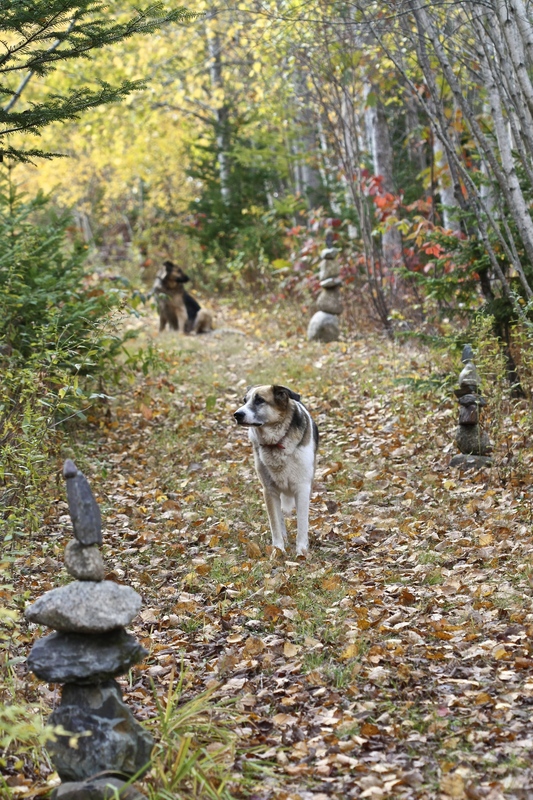 But I am hoping to send the message that this is a sacred place, it has been well-loved and appreciated, and that maybe they’ll get the picture that if they love and care for it too, it will support and provide a beautiful and healing sanctuary for them also. 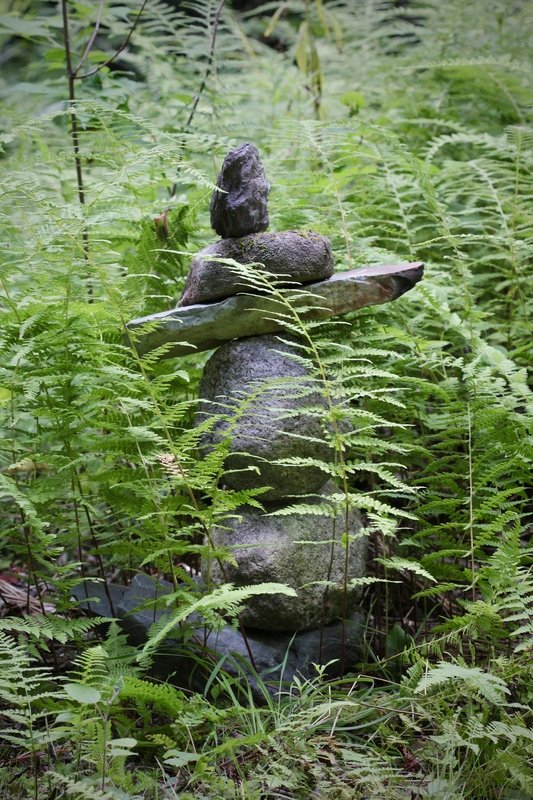 So, with extreme gratitude for the time I have enjoyed here, I ask my stone friends to call in and welcome the new people who will steward this land, and to offer them joy and wonder and protection and grounding as they create a new life here. What a lovely idea to leave your stone friends to welcome in new people! Lying here, iPad says 3.38 am,not to able to sleep. Hamsters are on the wheel. I am most receptive at this time and feel blessed to have had the pleasure of reading your ‘rocks revisited ‘. You do write beautifully. I can reach out and touch your thoughts as I too have a special closeness to the land. So when Bill and I went south she gave us the stone to keep us safe. It did because lt was magic. Oh I love that Mary! Yes intention is magic. 🙂 Thank you for reading and commenting!